An interesting report from a local news website in southern Italy appears to indicate that Bond 25, which starts principal photography with Daniel Craig as 007 in just a few weeks time, will make use of some Italian locations, including the historic city of Matera. According to claims made by the Sassi Live website, the plan apparently agreed with the 007 filmmakers will enable the production to make use of the beautiful medieval parts of Matera, a city which is located on a rocky outcrop in the region of Basilicata. Sometimes described as one of the region’s ‘hidden gems’, the city lies in a small sunny canyon and includes the Sassi area, which has a complex of cave dwellings carved into the mountainside, various abandoned buildings, an eye-catching Cathedral, plenty of old city walls and other distinctive constructions, together with the bonus of attractive views of the wider Sassi area. The website reported that the Sassi di Matera area, which consists of a couple of historic districts in the heart of the city of Matera, will see filming in the vicinity of the Cathedral and also in other nearby areas. Permission for the filming was apparently secured by EON after the conclusion of negotiations late last year. With its unique historical centre, the Sassi di Matera area was awarded World Heritage site status by UNESCO in 1993 and, over the years, a number of film and TV productions have made use of the buildings and the general area which, in some parts, is pleasingly reminiscent of the old building style of Roman-era districts of the Middle East. Major film productions shot in the Sassi area in recent years have included, among others, Mel Gibson’s The Passion of Christ (2004), the remake of Ben-Hur (2016), Wonder Woman (2017), and, just last year, Mary Magdalene (2018). Local tourist bosses have been keen to encourage new investment in the area, and recent film productions have helped realise this ongoing strategy. Securing some 007 filming will undoubtedly generate some extra publicity for the area, and will enable further targeted marketing aimed at attracting tourists to the city. If the report is accurate, it will – of course – be the fourth Craig-era 007 film to make use of Italian locations. 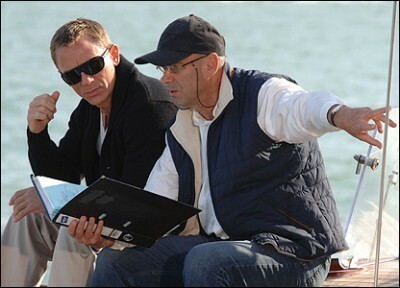 Casino Royale saw location shooting in Venice and Lake Como, Quantum of Solace utilised the Tuscan city of Siena and also Talamone, and Spectre, the most recent Bond movie, saw shooting take place in Rome and Vatican City. It will also continue something of a pattern of Italian location filming that the franchise has developed during its history: From Russia With Love made use of Venice, The Spy Who Loved Me saw key sequences in Sardinia, Moonraker returned to Venice, and For Your Eyes Only saw filming in Cortina and Ampezzo. The latest information on location filming for Bond 25, if indeed true, comes shortly after recent indications suggested Norway will also be utilised. The main production is due to be based at Pinewood Studios in England, with main filming scheduled to commence on 4th March, 2019. Watch this space for further news as it develops. You know the name, and you know the number.